Cute as a button with tons of curb appeal & mechanical updates too! 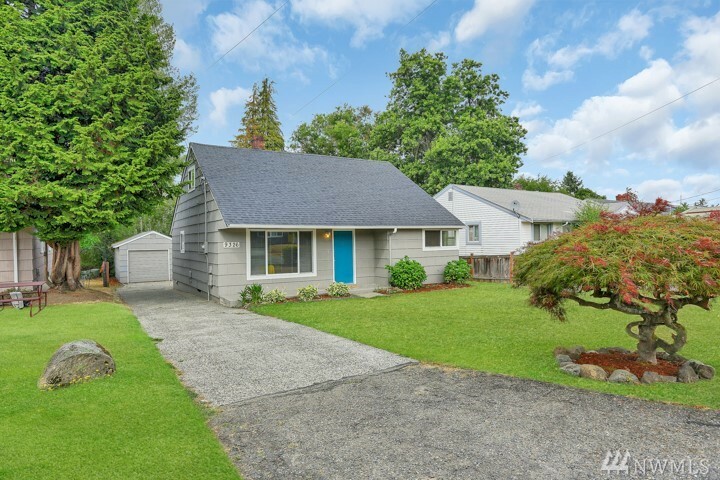 This mid-century Tacoma Craftsman sits on an extra-large lot & boasts a 100% new electrical package, vinyl windows, flooring & contemporary style choices! Main level has all the essentials with 2 large bedrooms, an updated bath, cozy living room & eating nook off the kitchen. Upstairs you’ll find a spacious, refreshed master suite for needed privacy. Don’t miss the garage, recently replaced roof, storage shed & fenced backyard! Just three miles away, you’ll find Wapato Park - an urban park featuring a woodland area, a lake, walking trail, plus a historic pergola full of stunning and colorful. Wapato has a number of trails that you can walk to explore the park, including one circling the lake that is approx .9 miles in length and you can’t beat the beautiful setting of the lake and forest. It’s best and most popular feature though is the off leash dog park! The off leash dog area has a smaller area for puppers under 25 pounds, a space for larger pups and an upper dog area for all dogs. The park also provides waste bag stations and garbage bins to help keep the park clean. Water is also available for the pups, there’s a water faucet and bowl. It’s prime blueberry picking season at Charlotte’s Blueberry Park - 5 minutes away off East D Street, you’ll find more than 3,372 bushes, representing five varieties of blueberry, produce fruit. Picking season typically runs from July through September each year. Get a variety of bread, bagels & pastries at the Franz Bakery Outlet. This family-owned business has been operating since 1906. And most items are generally half the cost of the grocery story or buy one get one free! Just across the street from Franz, you’ll find the local watering hole - Black Star Pub and Grill, a sports bar offering craft beers & pub food, plus live shows, pool tables & a patio with horseshoes. For a special evening, try Marzano’s, a local favorite for Italian or the highly rated Citron European Bistro which offers French, German & other European fare (such as wiener schnitzel & beef bourguignon). For something quick and easy that has award winning burgers, fries, & shakes swing thru Frugals. Close to freeway access 512 onramp for commuters. Are you looking to sell or buy a home? CALL/TEXT Realtor, Ryan Knicely for more information at 253-343-4049.